The crowd roared when a shot from North River’s Brian went just wide, but he knew he had to get back on defense. 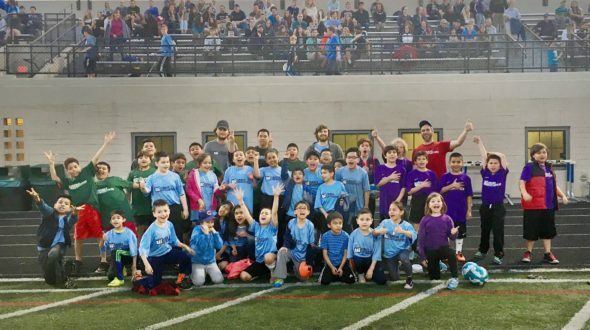 During halftime of Saturday’s ultimate frisbee game between the Chicago Wildfire and the Pittsburgh Thunderbirds, Work to Play players from three schools showcased their skills and sportsmanship for hundreds of cheering fans. 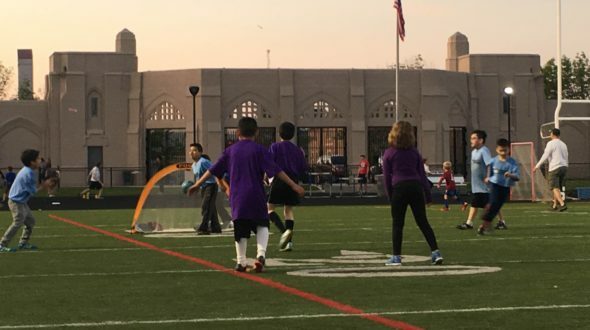 On top of seeing a great game and getting to play soccer in Lane Tech’s beautiful stadium, the kids will be the beneficiaries of a portion of the tickets sales of the game, which will go to support Urban Initiatives programming. Though it was their first time seeing a live game, the players from Bateman, Prieto, and North River got a taste of ultimate earlier in the week. There are definitely a few new recruits for the future! All of the players had a great time, but they may not have known that ultimate frisbee shares a lot of the values that they learn during Work to Play practices. The league that the Wildfire play in has an Integrity Rule, which prioritizes honesty over the “win at all costs” mentality. Urban Initiatives is grateful for the support of the Wildfire, not only from bringing the kids to the game, but for setting a great example of the power of sports and character.